David Calloway wrote that a couple of years ago, he was infected with the boatbuilding bug. 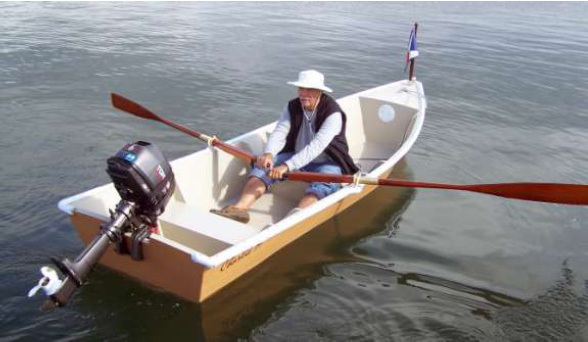 He spent many enjoyable hours looking for boats to build on the internet before he decided on Jim Michalak's QT design. With permission of the designer, David modified the plans somewhat, building the hull with stitch-and-glue plywood without any external chines. He also added a second seat. Under careful supervision from his dog, Wooster, Dave scarfed the sides of the hull, and nailed them to the frames, epoxifiying as he went along. He put a watertight compartment up forward and filled both underseat cavities with foam. Dave added that "Afloat on the water, CHARLIE M runs very smartly with the 6-hp outboard; steady, smooth, and fast, just like the man she's named after."